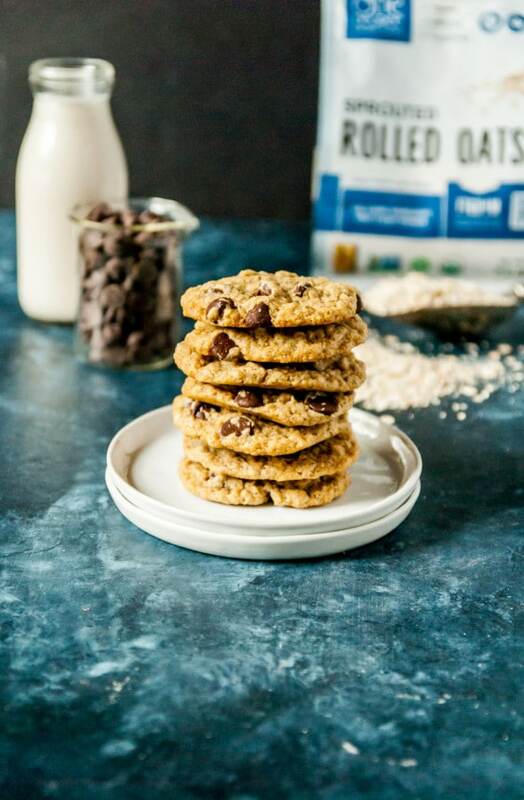 These vegan oatmeal chocolate chip cookies have crispy edges and gooey centers. Best of all, there’s no chilling time required! This post is sponsored by One Degree Organics. Thank you for supporting the brands that make this space possible! Way back in the day, I was one of those Midwest kids who was in 4-H year after year. If you grew up in the Midwest, you probably knew it as the club that all the farm kids were in, the ones who raised chickens and cows and couldn’t hang out because they had animals to tend to and whatnot. But for me, it was more about being part of a club where I was able to do a lot of different things, like build model rockets (my dad loved that one!) and experiment with a microwave muffin recipe (don’t ask for it, trust me you don’t want it). I think a lot of my love for baking started when I joined 4-H, since I almost always chose to enter into at least a few baking projects and loved the heck outta selecting recipes and finding out which ones were winners. But the oatmeal cookies that came out of one project still stick with me to this day. They were always crisp, chewy, and consistently came out just right, without any chilling or waiting necessary (i.e. perfect for an impatient baker like myself). It got to the point where they were my signature cookie and I got requests to bake them for just about everyone we knew. 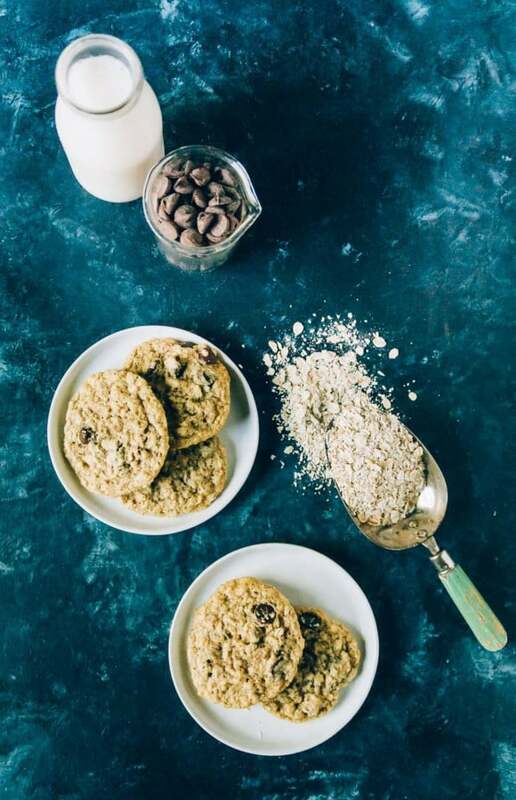 When I set out to make these vegan oatmeal chocolate chip cookies, I wanted to recreate those famous 4-H cookies, but with a healthy dose of chocolate and none of the eggs and dairy that usually come along with them. Honestly, I am not an oatmeal raisin cookie fan at all and would much rather eat no cookies than a cookie with raisins in it, so oatmeal chocolate chip cookies seemed like the perfect cure! These vegan oatmeal cookies turned out just like the version I used to make and enter into the county fair, with crispy edges, a chewy center, and melty chocolate chips that are just warm enough to make them a little bit addictive. 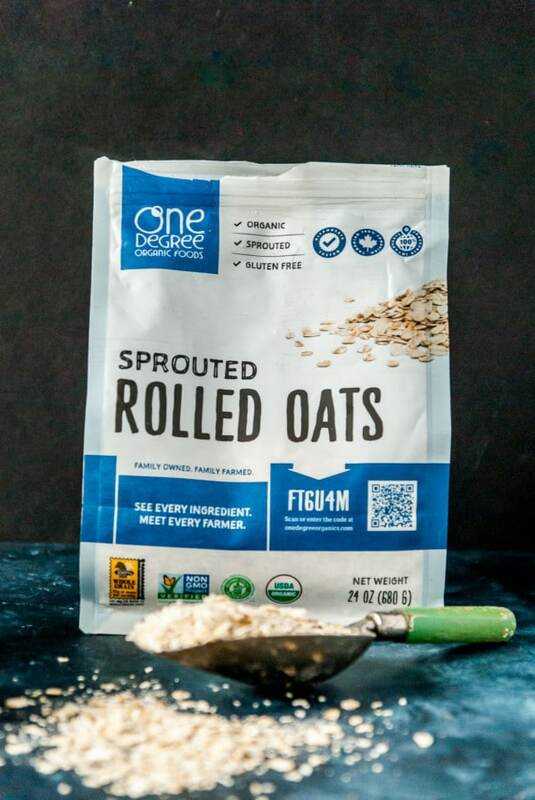 For this batch of vegan oatmeal cookies, I used One Degree Organic’s Sprouted Rolled Oats. 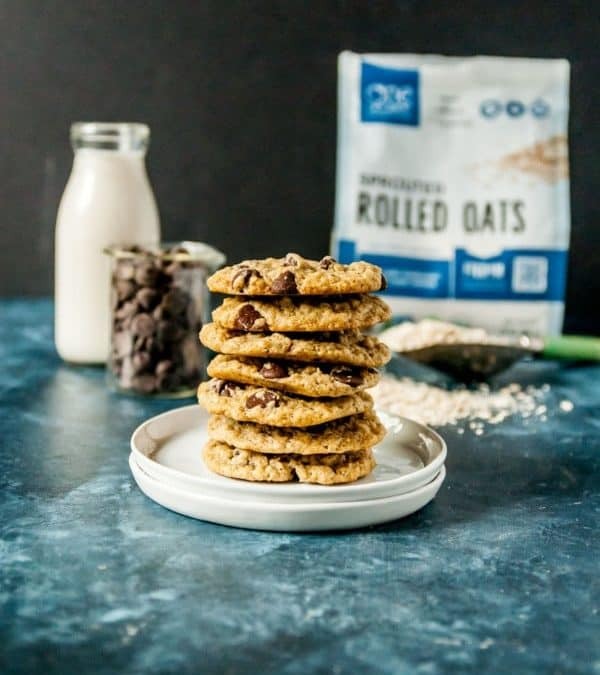 They were perfect for the cookies, making them dense and hearty, without weighing them down or making the dough super thick (which can sometimes happen with oatmeal cookies). 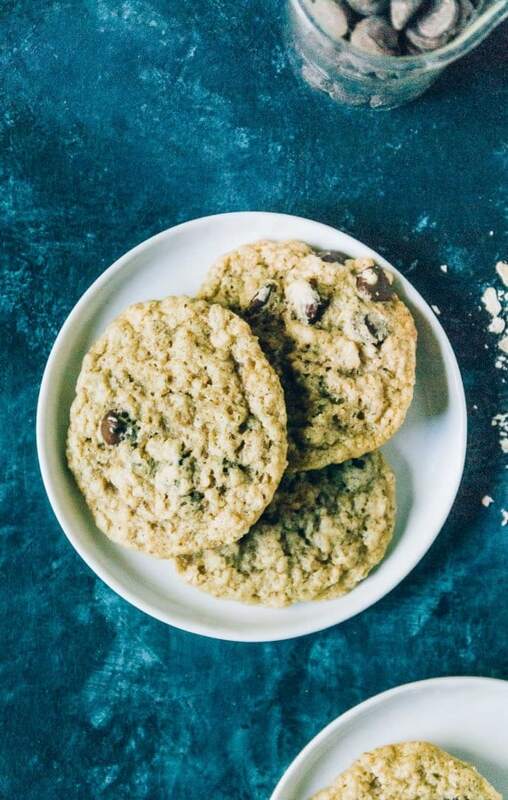 I can attest that this vegan oatmeal chocolate chip cookie recipe is the one that can’t be beaten since I tested it three times in one day and then took the results to a whiskey tasting party later in the day, only to have them disappear instantly. 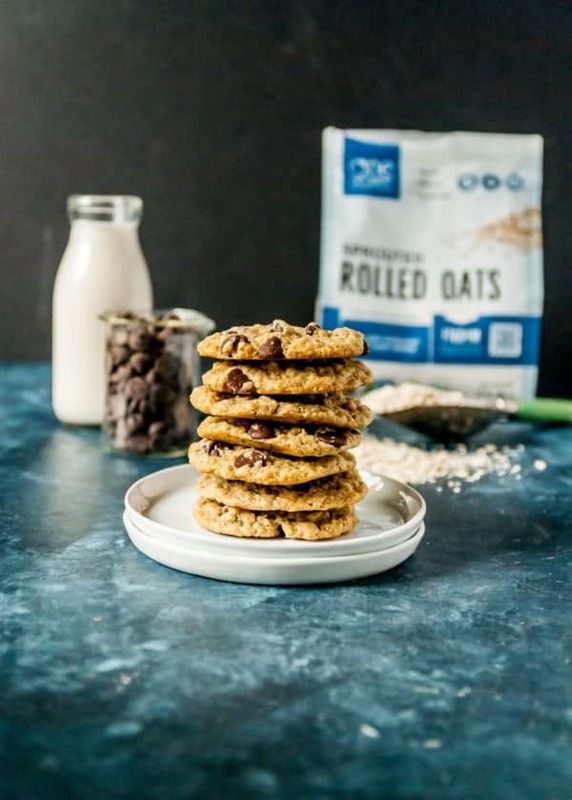 I also love that these are a little more substantial than your regular cookie, since the oats have a little more staying power and the chocolate just makes everything better. If you’re new to vegan baking recipes, you might be worried that these cookies will have an insane number of steps or require lots of hands on prep work. Admittedly, cookies (vegan or not) often do require chilling, but these vegan cookies are ready to eat in around 30 minutes and require nothing more than mixing all the ingredients together and plopping the dough onto a baking tray. The only way you could go wrong with this recipe is if you try and bake these cookies on an ungreased or unlined baking tray. Parchment paper is key here, otherwise the cookies you so lovingly made will wind up stuck to the tray and will be impossible to eat (been there, done that!). If you’d like, you can prep the vegan cookie dough ahead of time and freeze it for later. You can also bake the cookies like normal and then freeze them once cooled. Frozen vegan oatmeal cookies are great for making ice cream sandwiches, or you can reheat them by popping them into the oven until the chocolate chips turn gooey again. Finally, I know I usually talk about cookies and weather and how to make the best desserts around here, but I can’t go without acknowledging the horrific events that took place on Sunday. My heart breaks for each and every family who now has lost a mother, daughter, sister, son, or friend in the senseless tragedy that took place. While it feels helpless and disheartening that these kinds of events keep happening, I urge you to reach out to your lawmakers and push for change and talk more around the bigger conversation. In the meantime, consider donating blood or reaching out to those who might need help in this time. In the end, we are all human and deserve kindness and love at all times of tragedy. So much love and graditiude to each and everyone one of you. In a large bowl, combine all ingredients, except for the chocolate chips. Mix on low to medium with a hand mixer, until dough starts to come together. Add the chocolate chips and mix on low until just combined. Scoop dough onto the prepared baking sheets by the tablespoon. Bake for 10 minutes, until edges are golden brown. Remove from oven and allow to cool for at least 10-15 minutes. The cookies are going to seem puffy when you remove them from the oven. That’s perfect! As they cool, they deflate a bit and end up getting chewy, perfect edges. This cookie was a winner for you many times. If I remember correctly, you took these to the Illinois State Fair too! I’ll be making this version for sure. Well done, Abby! yum! would it be possible to add peanut butter to these? Hi James, I haven’t tried it, but I think adding 1/3- 1/2 cup of peanut butter into the recipe should work! Oatmeal cookies are my weakness! They look perfectly soft and chewy. Also, can we hang out with these cookies and a whiskey tasting party? That sounds excellent. YES! That sounds like a dream! Ohh that’s a great idea! 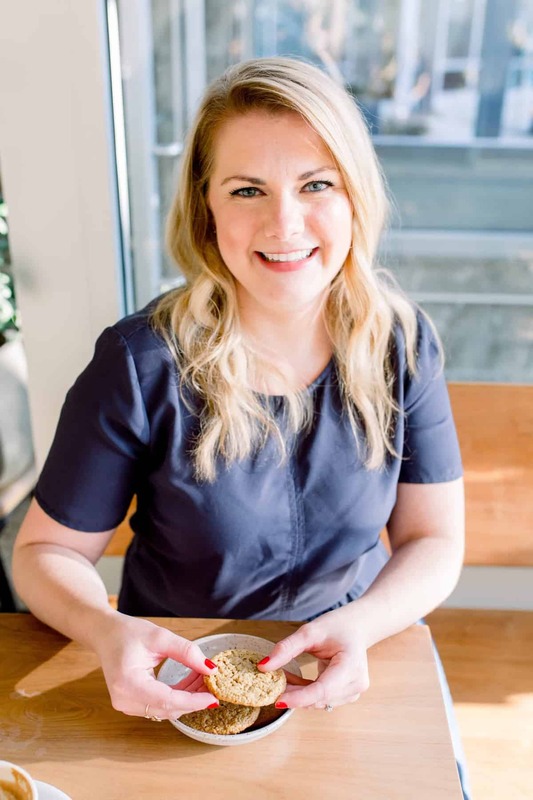 Can I sub oat flour to make it gluten-free? I haven’t tried, but let me know if you do!